Monte Pindo stands out. It is impossible to miss as you approach it, not only because the mountain is easily the highest geographical feature in the area. The topography of the mountain starkly contrasts the rolling, verdant hills of the surrounding Galician countryside. Stark is an apt word as Monte Pindo is a brooding, hulking, largely treeless mass of granite rising 627 meters (2,057 feet) directly from the Atlantic Ocean. Small as mountains come, Monte Pindo is nonetheless intimidating and captivating as the numerous legends associated with it attest to the power of Pindo. Ramón Otero Pedrayo was the first to call Monte Pindo the Celtic Olympus due to the abundance of these myths. In fact, some might argue that the name Pindo is Celtic in origin and derives from Binn dubh, meaning dark top. While Otero Pedrayo probably overstates Pindo’s significance on a larger scale, the mountain certainly has captivated local populations for generations in this corner of Galicia. Pindo’s peak, A Moa, with Cape Fisterra in the background. The best panoramic view of this corner of Galicia is, of course, atop Monte Pindo’s summit, called A Moa. The easiest route to the summit begins in the hamlet O Fieiro, where there is a car park at the trailhead of Ruta 2. This gently ascending, 3.9 kilometer trail is an easy introduction to Monte Pindo. On the left, the forested and undulating Galician countryside; on the right, the severe, barren eastern slope of Monte Pindo. In 2013 the area suffered a devastating fire. While the environment has nearly returned to normal, charred pine trunks still litter Pindo’s landscape. The absence of trees also makes it easier to spot caves and rock crevices. During the Spanish Civil War (1936-1939) these natural hideouts were used by men from local villages–O Fieiro, O Pindo, O Ézaro–to evade Falangist forces. The local women hung white sheets in the villages as a warning to the men hiding on the mountain not to come down to the villages because Franco’s soldiers were in the area. The occasional surviving pine or chestnut tree and the laurel, holly, and gorse that are found along Ruta 2 eventually give way to the exposed solid granite summit, A Moa. Here the forces of time and weather have left their indelible marks: some two hundred small relief pools from water erosion populate Pindo’s peak. 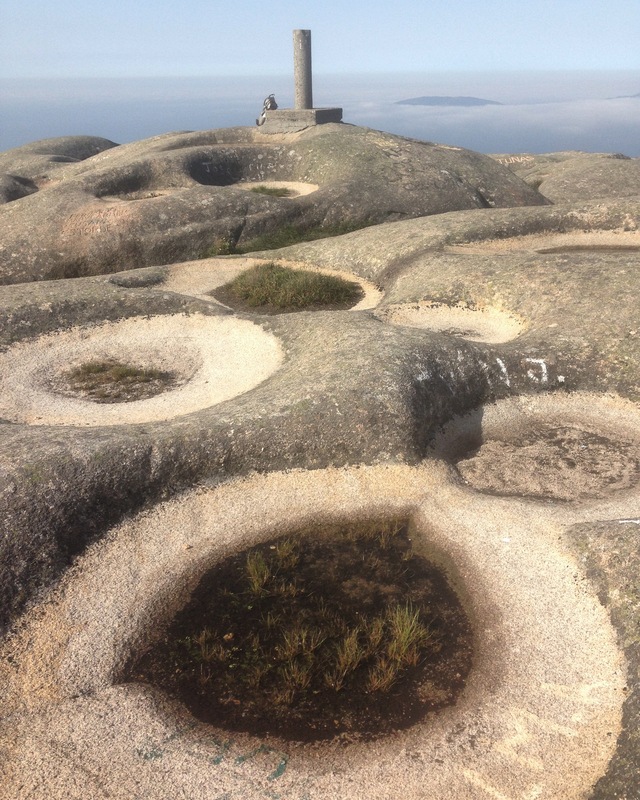 These granite bowls were supposedly used in pagan rituals as participants washed themselves in the erosion basins while praying to the sun setting behind legendary Cape Fisterra, which lies to the west of Monte Pindo. Carnota Beach, the longest in Galicia at seven kilometers, stretches south of Monte Pindo, while the village of O Ézaro lies to the north. The Ézaro waterfall cannot be seen from A Moa, so you must descend to the village to see the only waterfall in Europe that falls directly into the sea. You can return to O Fieiro by the same Ruta 2 trail but there are two other options that allow you to explore more geological and mythological wonders of Monte Pindo. Ruta 3 leads back to O Fieiro but is much more demanding than Ruta 2. However, the payoff is worth it as two of Pindo’s most interesting sites can only be accessed via Ruta 3. Leaving A Moa, we take a portion of Ruta 4–more on this route later–to meet the trailhead of Ruta 3. This trail cuts through thick laurel and gorse along the western slope of the mountain, affording great views of O Pindo Beach and, in the distance, the towns of Cee and Corcubión, beautiful Langosteira Beach, and the famous lighthouse of Cape Fisterra. Care must be taken on Ruta 3 as its lack of use leads to undergrowth that can obscure both the trail markers and the trail itself. The path eventually crosses a ridge and descends through a heavily wooded dell on the northeastern side of the mountain. A colossal wall of granite rises on one side of the valley. If you look at the right spot you can see one of two entrances to the Cave of Xoana, a natural formation that pierces the mountain completely from side to side. Once believed to be a crematory, it was also believed that local witches met in the cave on the night of the summer solstice to perform rituals and terrorize the local population. The trail to the cave deviates from Ruta 3 but is signposted. Ruta 3 continues through trees and brush before ascending to the base of Peñafiel, the site of perhaps the most interesting legend of Monte Pindo. The highest crag of the peak is flat on top–akin to a stone bed. Couples unable to bear children would climb to the top and copulate, hoping that the magical properties of the mountain would aid conception. When Christianity reached the area, the local bishop threatened excommunication to any couples that went to the “bed of fertility.” If hikers wish to test the veracity of this myth, they must venture off the trail and scramble up Peñafiel. If not, continue on the trail to reach O Fieiro, the trailhead of routes 2 and 3. Ruta 4 is an alternative trail that can be linked with Rutas 3 and 4 to create a sixteen-kilometer circular route around Monte Pindo, taking in all the wonders of the mountain. The trailhead starts behind the church in the seaside village of O Pindo. Ruta 4 is a much more challenging ascent to A Moa than Ruta 2. However, frequent stops to rest allows the hiker to see the fascinating rock formations that are encountered along the route. The serrated peak of O Pedrullo appears like jagged granite teeth. Further along the route is Chan da Lourenzo, where there is a plethora of anthropomorphic rock formations. The most striking is O Xigante, an immense granite boulder that looks like a sentry, complete with rock arms and an oblate boulder as its head. The image of O Xigante standing guard before the final ascent to A Moa is unforgettable. It is worth exploring the area for other fascinating rock formations–one legend says that the anthropomorphic boulders are Celtic warriors turned to stone to protect their sacred mountain. Evidence of strip mining for tungsten also can be found in Chan da Lourenzo. Route 4 links up with Route 3 shortly after passing O Xigante. However, you can continue climbing to A Moa, then take Route 2 to walk to O Fieiro to complete the circular route via Route 3 and finally descending back to O Pindo via Route 4. This circular route is challenging and to be avoided in inclement weather. However, the result will leave you enchanted by Pindo, much like generations past. Enjoyed your post and the pictures. Can you hike the entire route in a day? When you and Dad hiked to Fisterra could you see Monte Pindo? The circular route is 16 kilometers so, yes, it can easily be done in one day. You can see Monte Pindo from Fisterra; in fact, I am almost certain the bus passes by the village of O Pindo and the base of Monte Pindo.